Game Connect - Online video game database software. Automatic game details & cover art. Sign up for a free trial. Fans of the franchise and newcomers alike will relish the opportunity to catapult themselves headlong into a real adventure, in a search for the fabled "Atlantis of the Sands." The journey propels fortune hunter Nathan Drake on a daring trek into the heart of the Arabian Desert, a journey that pits him and his mentor Victor Sullivan against the occult treachery of a shadowy clandestine organization and its ruthless leader. When the terrible secrets of this lost city are unearthed, Drake's quest descends into a desperate bid for survival that strains the limits of his endurance and forces him to confront his deepest fears. Bigger set pieces and more explosive adventure, driven by Naughty Dog's signature storytelling and cinematic presentation. Competitive and co-op multiplayer return with brand new experiences and massively expanded feature sets. The UNCHARTED universe provides online players with a unique Action Adventure multiplayer experience, bringing the cinematic elements of the single-player campaign into multiplayer. Nathan Drake can now take on opponents in more ways than before: hand-to-hand combat with multiple opponents, contextual melee attacks, and new stealth options. UNCHARTED 3: Drake's Deception also features expanded and diverse traversal moves with deep gunplay. Naughty Dog introduces new physics, visuals, and environmental effects. UNCHARTED 3: Drake's Deception features new innovations in sand, fire, smoke, and water dynamics and effects. 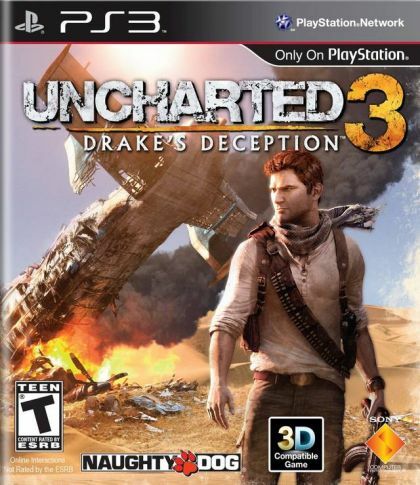 UNCHARTED 3: Drake's Deception will be playable in Stereoscopic 3D.